Who should be allowed to compete as part of Team GB? February 21, 2018, 2:11 p.m.
With the Winter Olympics in full swing in Pyeongchang, many Brits were surprised to find Team GB’s first ever skiing medallist Izzy Atkin speaking with a distinct American accent during interviews. Atkin, 19, who was born and raised in the US, is eligible to compete as part of Team GB because her father is British. This raises the question of how strong a sportperson&apos;s connection with Britain should be in order to be eligible to join Team GB. Previously, the issue came up over the inclusion of Zharnel Hughes and Cindy Ofili during athletics championships in 2015, with some branding them “Plastic Brits” – competing as part of Team GB despite having perhaps only a fleeting link to the nation. Now a new YouGov survey looks at what backgrounds Britons believe should make someone eligible to compete at the Olympics as part of Team GB. Ultimately it seems only a third of people would have admitted Izzy Atkin on to Team GB, with 34% saying that it is acceptable for someone born abroad to at least one British parent but who grew up – and still lives – abroad to compete for Britain. 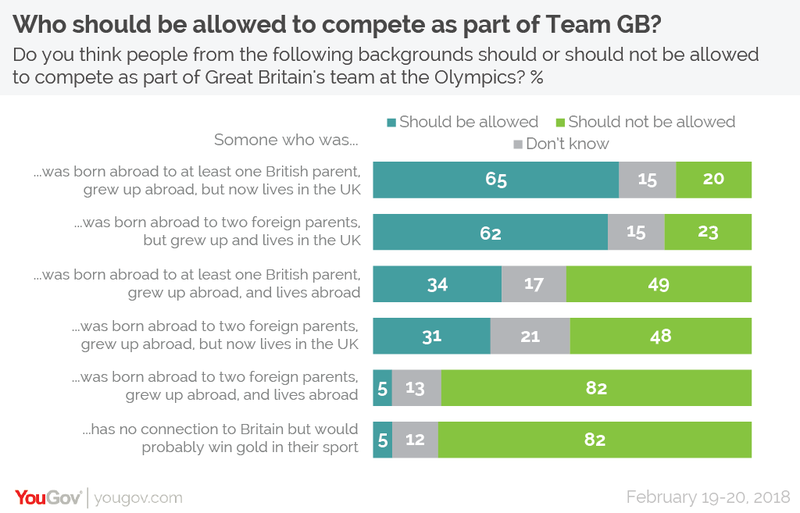 By contrast, around two third of Brits (65%) say that an Olympian born abroad to at least one British parent, who grew up abroad but now lives in the UK should be allowed on the team. An almost identical proportion (62%) said the same of someone who was born abroad to two foreign parents but grew up and currently lives in the UK (such as Mo Farah). Only 31% of Brits think a competitor should be admitted to Team GB if they had been born and raised abroad to two foreign parents but now lives in the UK. Even fewer people – just 5% – believe that someone born abroad to two foreign parents, who was raised and still lives abroad, should be allowed to compete on the British team. Finally, the results show that Brits don’t think the prospect of a gold medal should be able to buy a foreign Olympian a place on Team GB. Only one in twenty (5%) believe that someone with no connection to Britain but who would probably come first in their sport should be allowed on Team GB. While Brits are united across society on not wanting competitors with no connection to Britain but would probably win gold and those born to two foreign parents who grew up and live abroad to be part of the team, there are noticeable differences between groups on the four listed backgrounds with stronger connections to this country. Working class Brits and Leave voters were consistently less likely than their middle class and Remain-voting counterparts to say that someone from these four backgrounds should be allowed to join the team (the pairing is unsurprising, as there is significant overlap between the two groups). Leave voters are between 13 and 22 percentage points less likely than Remain voters to someone from one of the other four backgrounds should be permitted to join Team GB. Among working class people the difference with middle class people is between 6 and 18 percentage points.